Great news. 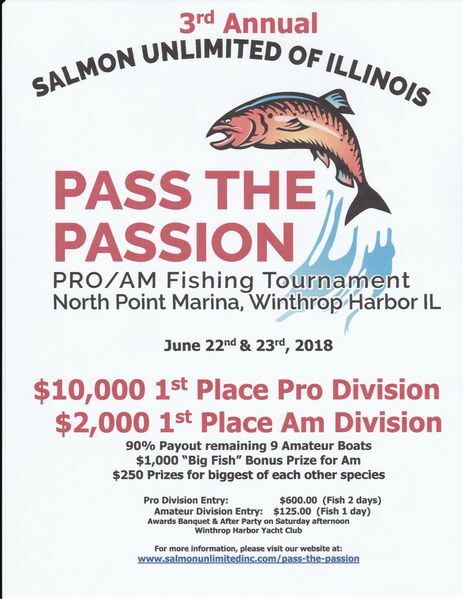 $2000 first place for Am and $10,000 for pro and a nice big check for an IL HS fishing team. it's only year 3! Big thanks to all involved in presenting - building this event. Fishtrap will be there. Hope alot of you join us. This will be a great event! Thanks to the board for their efforts to secure some serious sponsorships. Still have openings for additional sponsors if anyone has someone in mind. Please PM me. Sorry, no more free slips. Are the rules all set for the Pass the Passion Tournament? I tried looking them up, but couldn't find anything. Did I not look in the right spot. I think I found them. But, are they being updated at all? Also, are there any observers that are volunteers? I see they would need to 18 years of age or older. Observers only needed for Pro boats. You have to ask around for observers. Need to be 18 or older. Yes. That part was understood. I was contemplating the Pro Side and was just reviewing all the rules. Our chef for the Club tournaments is making hamburgers with potato salad for this tournament on Saturday afternoon at the yacht club. Glad tournament time is back! My boat is kept in waukegan harbor. Do I need to be in northpoint prior to the start or can we leave from there to fish and goto northpoint directly after fishing by water for the weigh in? It' always easier to ask forgiveness than permission. You have to be at the captains meeting Friday at 7 at the SU Pavilion, then you can motor in front of Northpoint in the morning and there will be a check in on the radio. So yes, you can be in front of the harbor before the run time starts but you must bring your cooler to the weigh in at Northpoint by Water! The rules state within 1000 yards of the pier heads. You start and return to NP marina. Do not stage in front of the harbor mouth for obvious safety reasons. Chitown-Angler was started on February 10, 2003 and has received 207577617 page views in total since that date.